I’ve been reading a great new psychology book that should help in developing characters, especially the settings which reveal so much about a character. 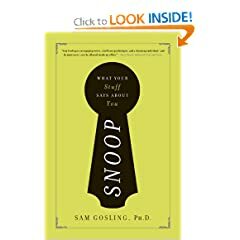 Snoop: What Your Stuff Says About You by Sam Gosling, Ph.D. is a fascinating book by a psychologist who studies a person’s environment and what that environment says about you. Variety of books, magazines, music — this is a person who is open to new experiences. Well-lit, uncluttered and organized books and music — this is a conscientious person. Inspirational posters — this is a negative or anxious person. Decorated — this is a negative or anxious person. Not only does he tell you what to look for, he also details the things that people mistakenly look at when trying to evaluate a person’s psychology. The nuances of our Stuff are fascinating to read about and the book is easy to read. It’s a good resource when you are creating new characters.